Our eldest son is a chocoholic; he can eat Nutella sandwich everyday starting from breakfast. I cannot imagine starting a day with that much of sugar. My oats will have only a dash of brown sugar or a drizzle of honey. He has got the sweet tooth in my family. Since the boys are very active, I don't mind giving them some sweets as they burn it fast opposed to me. Since it’s the great lent period my son asked if I could make some chocolaty dessert without the use of eggs. I tried my hands on this egg-less Brownies. I am an ardent fan of avocados and I can have them raw or in my salads. So Avocados are always found in my refrigerator. Avocado was the best substitute I could come up with for eggs. After checking few online vegan brownie recipes, I thought to make it with what I have in my pantry rather than buying all the things I won't use otherwise. My first attempt was with all purpose flour and the texture was too fudgy. In my second trial, I used wheat flour and it gave me the texture I was looking for. 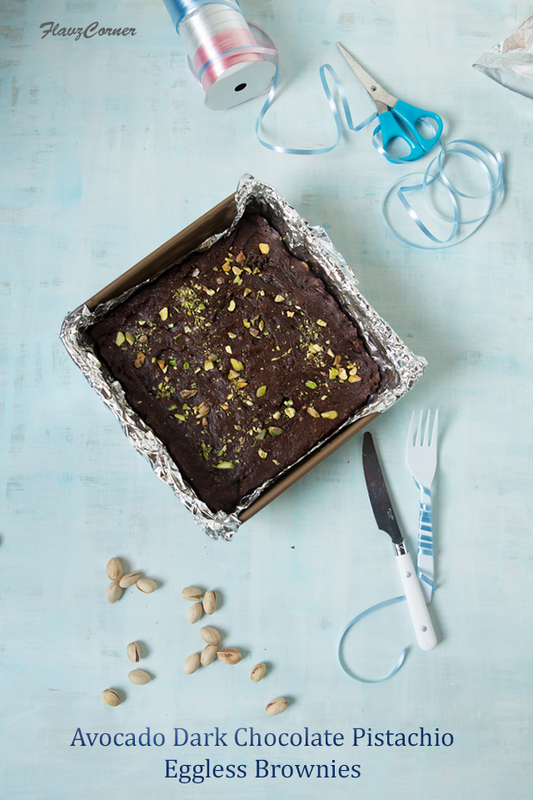 The soft and moist texture of the brownies with the bite into dark chocolate bits and nutty pistachios is a delectable guilt free dessert to indulge into when you are craving for chocolate dessert. 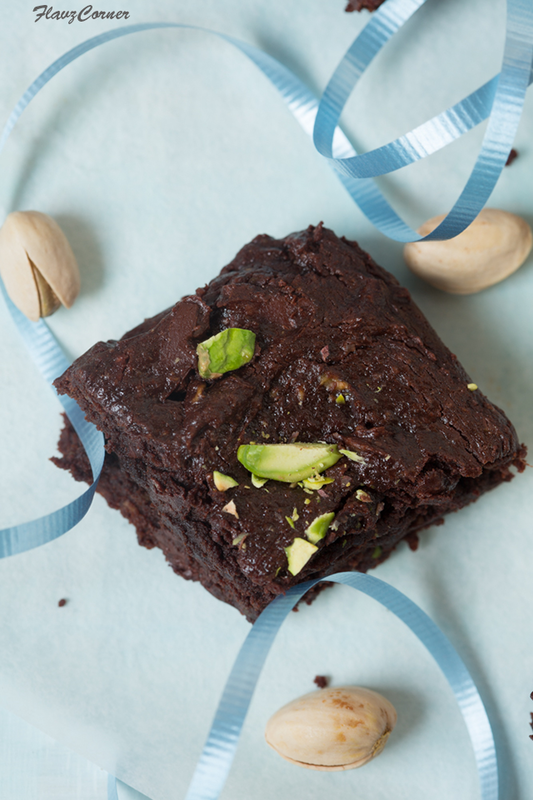 The dark chocolate flavor over powers the avocado in this brownie. So my son didn't complain about the taste at all. You can substitute water with some strong espresso if you are not too fond of avocado flavor. Hope you will give this recipe a try. We got a good share of snow in mid February. I have no complains this year as the winter was very mild when compared to last year. I am eagerly waiting for some sunshine so that we can get out and have some outdoor activities. Kids are so ready to jump out without their jackets and boots. Hope the warmth and sunshine is waiting at the door steps to invade the cloudy and cold days. Preheat oven to oven to 350°F. Line a 8 x 8 square baking pan with aluminum foil with some overhang and grease it. Sift the dry ingredient together and keep it aside. 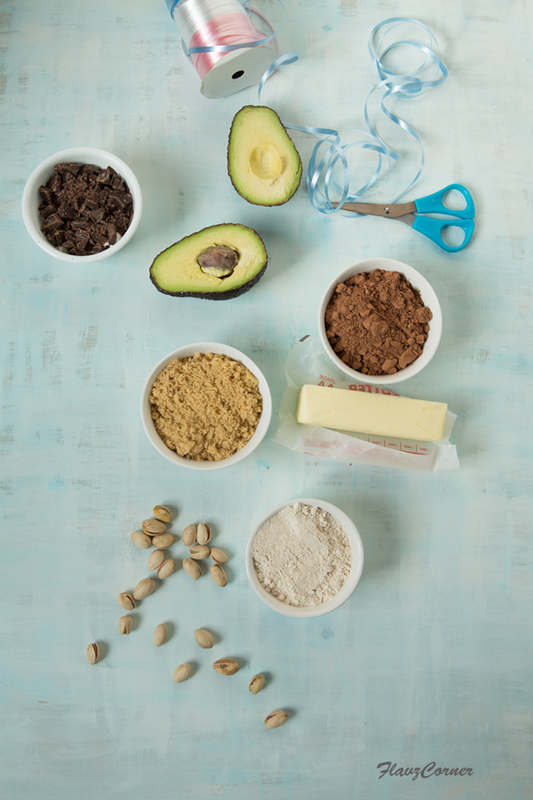 Mix all the wet ingredients in a mixing bowl with a wooden spoon to get a smooth mix. Now add the dry ingredients and mix till everything is incorporated well. 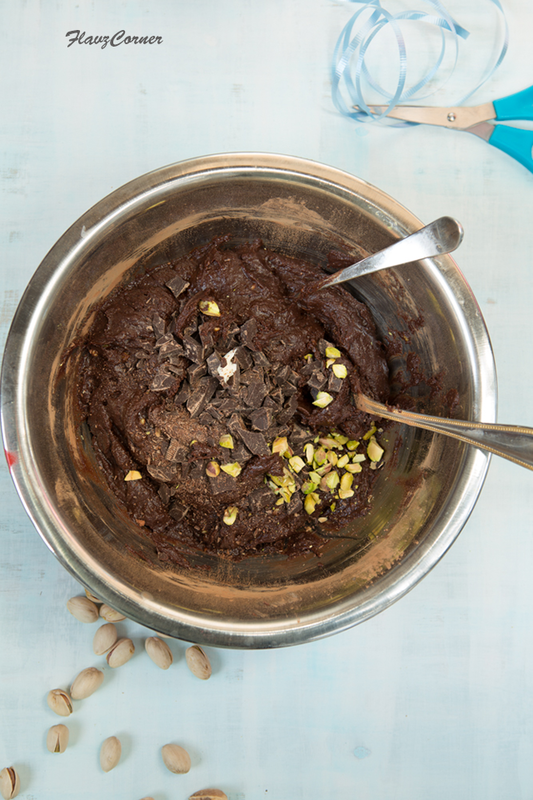 Fold in the chopped chocolate pieces and 1 tbsp of chopped pistachios into the batter and fold them well. Pour and spread the batter into the prepared pan evenly. 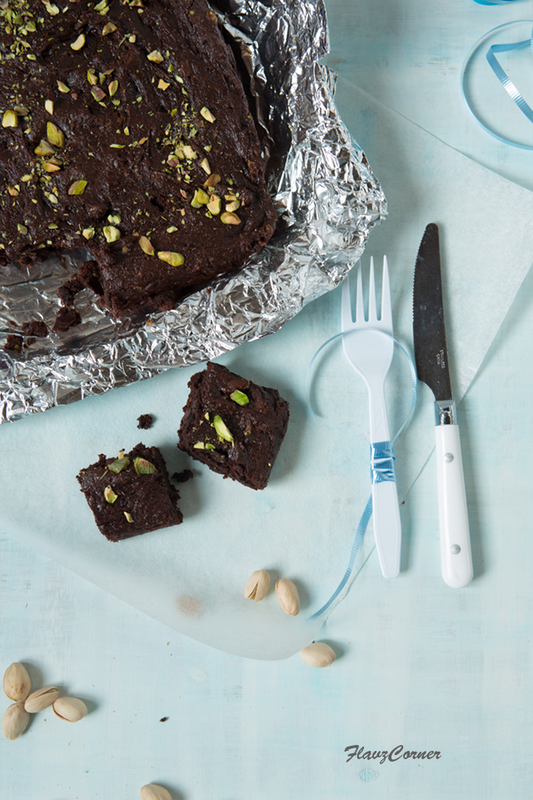 Sprinkle the chopped pistachios on top of the batter and press gently using the back of a spoon. Bake the brownies for 30-35 minutes in the middle rack or till a wooden skewer comes out clean when tested in the center. Allow the brownie to cool completely on a wire rack. 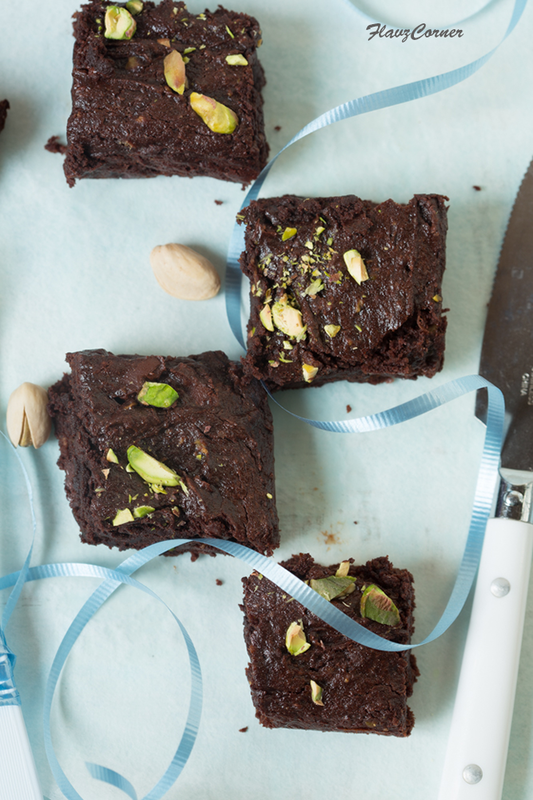 Cut them into desired shapes and enjoy the fudgy yummy brownies with a glass of milk. The left over can be kept outside for 2 days and if storing for more than 2 days, keep them refrigerated in an air tight container. 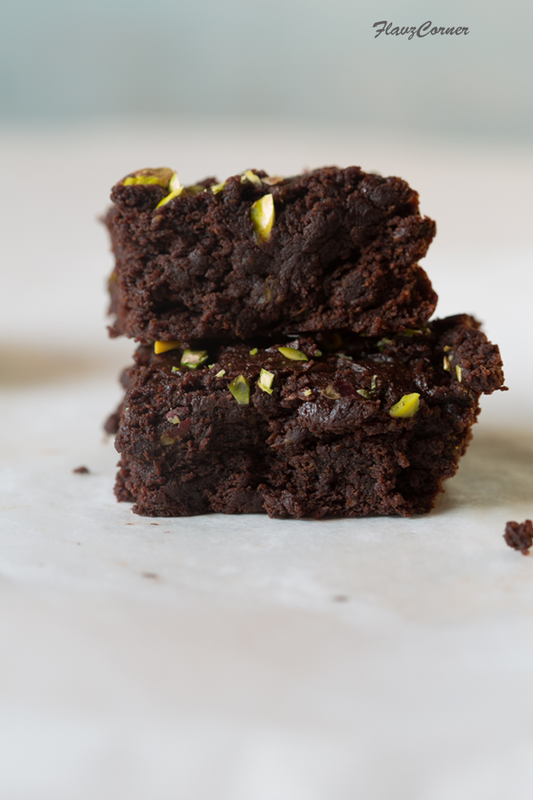 I love to bake brownies with avocado too. This looks amazing! When I was a kid, I used to load up my cereal with sugar. Now, I don't use any -- just a bit of cinnamon on oatmeal. Just can't eat something sweet first thing in the morning. So I'd have to wait an hour before I had these. :-) Really good -- thanks.